Rhabdomyosarcoma is a rare cancer that often strikes children and adolescents. Tributes share the stories of those who have died with sarcoma and raise money for research in their memory. Ashley was born in September of 1994. People commented on how beautiful she was. Ashley was an exceptional girl. She was just over 5 feet tall, but she had an explosive personality. 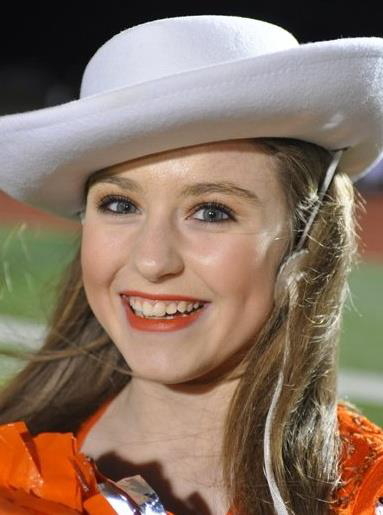 She made terrific grades in school, enjoyed belonging to church and, most of all, loved dancing and being on the HS Drill Team; her nickname was "Bubbles." She smiled often and her exceptional manners were often noticed. She had a larger-than-life personality that shined in front of people who knew her. Ashley had a terrific sense of humor and a quick wit. She was affectionate, compassionate and faithful. She was competitive, when it applied, because she always cared about doing her best in everything she did. Low blood counts kept Ashley from attending school. As a home-bound student, she took only the core subjects. Her lowest grade was 91% and she ranked 31 of 146 in her class and she maintained a 3.7 GPA. Ashley was an inspiration to all who knew her. Ashley loved Harry Potter and Twilight - she read all of the books. She enjoyed all kinds of music, loved movies and gaming. She loved animals, especially dogs and horses. Ashley has a brother, Jackson. Ashley would read and play with her little brother. She loved him so much. She chose a Make-A-Wish trip to Disney so that her little brother could meet Jessie the cowgirl. She was a terrific big sister. Ashley did get her driver’s permit. On purpose, her first journey on the street was a funny one. We started out at the egg farm, (not a lot of people can say that) went to the fire station, then home. She did quite well, and even did well with parallel parking. Ashley really enjoyed life! In mid-March of 2010, we started to notice Ashley’s energy levels changing and her appetite waning. She complained of her leg hurting, and we thought maybe she had injured herself practicing for Drill Team tryouts. April took her to the local clinic because her leg hurt and was told that maybe Ashley had just sprained it. If it wasn’t better in a week, we were to consult an orthopedist. The morning before Ashley’s orthopedic appointment, she walked into the room looking extremely pale and told April that her chin was numb. After asking the orthopedic about the bizarre symptoms he told us it wasn’t his realm of expertise to consult our general physician. That same day April took her to our small-town doctor who told us immediately that Ashley was anemic. April knew that there was not a good reason for that. After blood testing was done it revealed that Ashley had an extremely low hemoglobin count and we were told to take her to the hospital immediately. The morning of March 31, we heard the cancer word for the first time. At first they told us leukemia, which we thought was bad, but then they told us it wasn’t. It took five days for us to find out her final diagnoses. Over Easter weekend we watched our beautiful girl go from bad to worse. Then we were taken to a room to wait for the oncologist and we both decided to pray for God’s Will. Dr. Alex Gozman walked in the door, sat us down and quietly shook his head and told us that Ashley had Stage 4 Metastatic Alveolar Rhabdomyosarcoma. April and I looked at each other like, what!? We asked him to write it down. We told Ashley that she had cancer, and the doctor explained that we do have some testing to do, and chemo. Ashley had a chance to ask questions, "Am I going to lose my hair?" The doctor nodded yes, and Ashley responded back without missing a beat, "Dang, why can’t it be just the hair on my legs." The entire room went from complete silence to laughter. Ashley broke the ice, and that was her attitude during the entire time. 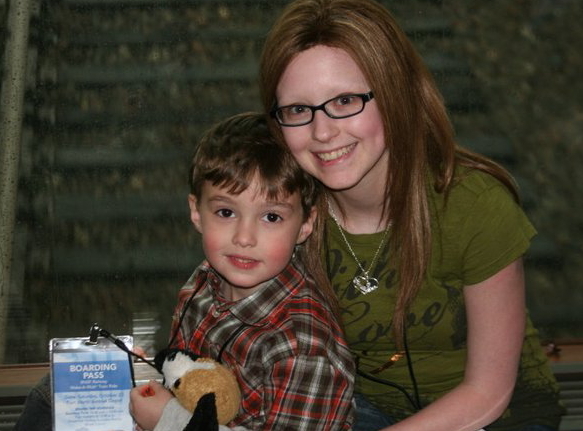 When chemo began, we allowed Ashley’s friends and family to visit. We told people that Ashley’s room is the 'No-Cry Zone.’ We met with all of the visitors in the visitors' area where we hugged and cried. Everyone told us how strong we are, but it's funny - we didn’t feel very strong. The doctors and staff always kept the family informed of what they were going to do before they entered Ashley's room. Our family developed a wonderful rapport with the staff that looked after Ashley, and they all loved her. Ashley also enjoyed many visits with her little brother, Jackson, and he was a hit with all of the nurses! I told Ashley once that I wish I could switch places with her. Ashley snapped firmly, "No, I have to do this." Ashley’s initial hospital stay was five weeks. When first admitted, the prognosis was grim: two weeks. We took turns out in the hallway crying out of frustration, as there was nothing we could do to make the situation less painful. Our parents felt completely helpless; there was nothing anyone could do for us except be there for us. I could tell it was very frustrating. 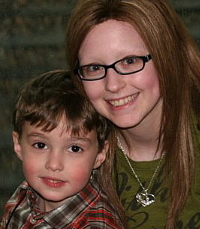 Ashley came for weekly chemotherapy as an outpatient with various hospital stays over the following months. 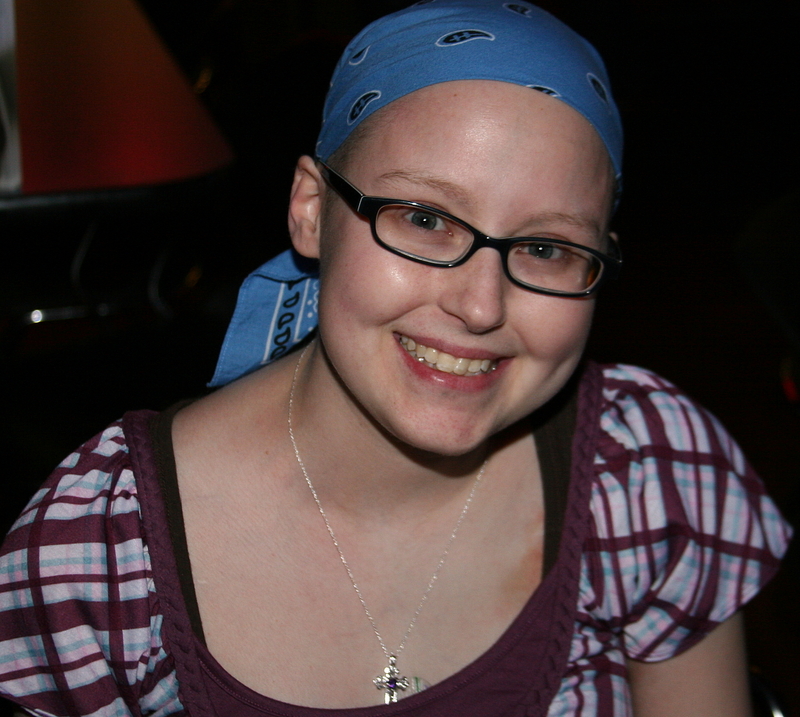 Ashley spent her 16th birthday in an infusion room getting chemotherapy. The nurses and social workers brought cake and presents for her. It was very special. She endured countless tests, medications, transfusions and procedures, which she handled with strength and dignity. She was a "warrior princess." It was heartwarming that so many friends and teachers came to visit Ashley. 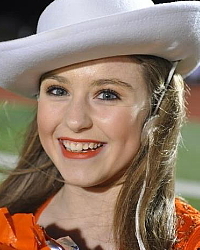 When her Drill Team friends came one day, Ashley laughed and smiled and told them how much she missed them. One of the girls noticed Ashley's yellowish-purple arm and said, "Eeeew!" Ashley said, "Well, then, I guess I won't show you my port!" She had an incredible sense of humor. We can only imagine the contribution Ashley could have made, to make the world better, had she been allowed to continue forward. Now, we have to take inspiration from the example she set for us, by accepting everything medicine offered her in her quest for a long and full life. Perhaps, from treating Ashley, the doctors have learned better ways to treat future patients diagnosed with the same cancer. 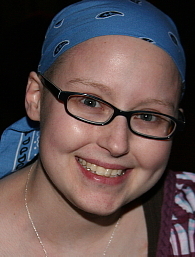 A week or so before she passed, Ashley's oncologist asked, "What would you like to do? You can stop treatment or you can fight, and we will be with you all the way." Ashley, with mask over her face to ease her breathing, held up her fist and said, "Fight!" She remained positive and optimistic that everything would work out for the best. Ashley faced every challenge with strength and grace. She wanted everyone to know to Believe and to have Faith. She was really strong with the Lord. The hardest talk we had to have was when Ashley’s condition changed and we needed to know what she wanted. I had to make four statements to her; it’s the hardest thing I have ever had to do. Her mom and I were a complete mess, but time was running out. We told her, "Your body is starting to shut down, but you won’t be in any pain. We are very proud of you, always have been and we always will be." The third was the hardest: "Ashley, we are going to miss you very much; we will find a way to get through this. Jackson will be taken care of, and you have permission to go." We asked Ashley what kind of service she would like. She wanted a big celebration with blue. We did it. No amount of prayer or excellent medical care could give this story a different ending. We all tried to will it to be different, but we did not have a magic formula. Ashley's memory will live on in the hearts of all who knew her. She, for sure, touched us all. The days and weeks since Ashley passed, have been difficult for the entire family. We all have never known such sadness. When Jackson catches Mom and Dad looking teary-eyed, he puts his arms around them and reminds them, "Ashley is in heaven and she's watching us." We all have to be strong for Jackson, so...we wipe away our tears and move on. Friends ask how we're doing. We're on an emotional roller coaster, and we take one day at a time. We experience a lot of peaks and valleys, and we are all looking forward to a time when there will be more peaks. To make an online donation in Ashley's memory: During the donation process, click on the blue "dedicate this donation" link and type Ashley's name before clicking on the large blue "proceed" button. Little research is done for Alveolar Rhabdomyosarcoma as it is so rare. Please be aware that 97-98% of your donations in memory of Ashley will be used for ARMS research. There is no doubt that Ashley would want us to go on and continue to fight this type of cancer so other exceptional young people will eventually get to live a full life. If you would like to help with a tax-deductible donation, please consider donating by check, as checks incur no processing fees. To donate securely online with a 4.9% processing fee, use the "donate now" button. Signatures in the Guestbook will appear here. Please share your thoughts! Ashley was an inspiration to not only to people with cancer, but also to all people with disabilities. She was very mature beyond her years and was very brave. In my book, she was truly "Disabled But Able To Rock"! Ashley, we will continue to fight cancer...such a terrible disease and no one should ever have to experience what we have. Your Momma, Jackson and myself are very proud of you, and we think about you daily. This time of the year is hard, but like I told you, we will make it. We love you to the moon and back! Ashley's story is very touching, and really hits home. I recently lost my sister Diana to rhabdomyosarcoma cancer as well. They had many things in common, smart, beautiful and most of all faith. God bless. We met Ashley when she was a little girl, through her grandparents, Mike & Sharon Miller. She was a beautiful child, extraordinarily bright, warm, loving and mature beyond her years. We felt like she was our Granddaughter too. We loved her dearly and miss her. She will always be a shining light in our hearts. God has blessed us by just knowing her.